"Rhus" redirects here. For plural of RHU, see radioisotope heater unit. For the commune in France, see Épiais-Rhus. For poison sumac, see Toxicodendron vernix. For other uses, see Sumac (disambiguation). Sumac (/ˈsjuːmæk/; also spelled sumach, sumaq) (Assyrian Neo-Aramaic: ܣܘܼܡܵܩܵܐ‎, translit. summāqāʾ, lit. 'red, red shift, turning red', Arabic: سُمّاق‎, translit. summāq, Hebrew: אוֹג‎, translit. ’og), is any one of about 35 species of flowering plants in the genus Rhus and related genera, in the family Anacardiaceae. Sumac grows in subtropical and temperate regions throughout the world, especially in East Asia, Africa, and North America. Sumacs are shrubs and small trees that can reach a height of 1–10 m (3.3–32.8 ft). The leaves are spirally arranged; they are usually pinnately compound, though some species have trifoliate or simple leaves. The flowers are in dense panicles or spikes 5–30 cm (2.0–11.8 in) long, each flower very small, greenish, creamy white or red, with five petals. The fruits form dense clusters of reddish drupes called sumac bobs. The dried drupes of some species are ground to produce a tangy, crimson spice. This shrub or low tree, belonging to the family Anacardiadeae, which includes the terebinth and the pistachio, grows wild in the groves of Palestine. The tree is dioecious, with pinnate leaves containing a high proportion of tannin which is used in the manufacture of leather, whence its Hebrew name og ha-bursaka'im ("tanner's sumac"). The female trees bear reddish fruits (in Syriac sumac means 'red') arranged in dense clusters. The fruits are shaped like lentils, and are hairy with an acrid taste. It is used as a spice by some Asian communities, and was used in the Colonial United States (giving rise to the tradition of "pink lemonade"), and in present-day North America. Its fruits (Rhus typhina, staghorn sumac), soaked in cold water, make a refreshing, vitamin C-rich beverage. It was cultivated in mishnaic times and is therefore reckoned with those fruits to which the law of pe'ah applied (Pe'ah 1:5), but in Palestine, where it grew wild abundantly, it was not very highly valued and a lenient attitude was adopted about pe'ah (Dem. 1:1). Sumacs propagate both by seed (spread by birds and other animals through their droppings), and by new shoots from rhizomes, forming large clonal colonies. The taxonomy of Rhus has a long history, with de Candolle proposing a subgeneric classification in 1825, with five sections. At its largest circumscription, Rhus, with over 250 species, has been the largest genus in the family Anacardiaceae. Other authors used subgenera and placed some species in separate genera, hence the use of Rhus sensu lato and Rhus sensu stricto (s.s.). One classification uses two subgenera, Rhus (about 10 spp.) and Lobadium (about 25 spp. ), while at the same time Cotinus, Duckera, Malosma, Metopium, Searsia and Toxicodendron segregated to create Rhus s.s.. Other genera that have been segregated include Actinocheita and Baronia. As defined, Rhus s.s. appears monophyletic by molecular phylogeny research. However the subgenera do not appear to be monophyletic. The larger subgenus, Lobadium, has been divided further into sections, Lobadium, Terebinthifolia. and Styphonia (two subsections). Rhus gerrardii (Harv. ex Engl.) Diels. The word 'sumac' traces its etymology from Old French sumac (13th century), from Mediaeval Latin sumach, from Arabic summāq (سماق), from Syriac summāq (ܣܡܘܩ)- meaning "red". Species including the fragrant sumac (R. aromatica), the littleleaf sumac (R. microphylla), the skunkbush sumac (R. trilobata), the smooth sumac, and the staghorn sumac are grown for ornament, either as the wild types or as cultivars. The fruits (drupes) of Rhus coriaria are ground into a reddish-purple powder used as a spice in Middle Eastern cuisine to add a tart, lemony taste to salads or meat. In Arab cuisine, it is used as a garnish on meze dishes such as hummus and tashi, and is added to salads in the Levant, as well as being one of the main ingredients in Palestine's national dish, musakhan. In Afghan, Armenian, Bangladeshi, Indian, Iranian, Jewish, Israeli Israeli cuisine, Kurdish and Pakistani cuisines, sumac is added to rice or kebab. In Azerbaijani, Central Asian, Jordanian and Turkish cuisines, it is added to salads, kebab and lahmajoun. Rhus coriaria is used in the spice mixture za'atar. In North America, the smooth sumac (R. glabra) and the staghorn sumac (R. typhina) are sometimes used to make a beverage termed "sumac-ade", "Indian lemonade", or "rhus juice". This drink is made by soaking the drupes in cool water, rubbing them to extract the essence, straining the liquid through a cotton cloth, and sweetening it. Native Americans also use the leaves and drupes of the smooth and staghorn sumacs combined with tobacco in traditional smoking mixtures. The leaves of certain sumacs yield tannin (mostly pyrogallol-type), a substance used in vegetable tanning. Notable sources include the leaves of R. coriaria, Chinese gall on R. chinensis, and wood and roots of R. pentaphylla. Leather tanned with sumac is flexible, light in weight, and light in color. One type of leather made with sumac tannins is morocco leather. The dyeing property of sumac needed to be considered when it was shipped as a fine floury substance in sacks as a light cargo accompanying heavy cargoes such as marble. Sumac was especially dangerous to marble: "When sumac dust settles on white marble, the result is not immediately apparent, but if it once becomes wet, or even damp, it becomes a powerful purple dye, which penetrates the marble to an extraordinary depth." Sumac was used as a treatment for several different ailments in medieval medicine, primarily in Middle Eastern and South Asian countries (where sumac was more readily available than in Europe). An 11th-century shipwreck off the coast of Rhodes, excavated by archeologists in the 1970s, contained commercial quantities of sumac drupes. These could have been intended for use as medicine, as a culinary spice, or as a dye. Staghorn sumac is a powerful antioxidant, with ORAC rating over 1,500 μmol TE/g. Also, the anti-hypertension effect of sumac has been investigated, with a clinical trial study showing significant effects of R. coriaria on reducing the blood pressure in hypertensive patients. Sumac stems also have a soft pith in the center that is easily removed to make them useful in traditional Native American pipemaking. They were commonly used as pipe stems in the northern United States. Some species formerly recognized in Rhus, such as poison ivy (Toxicodendron radicans, syn. Rhus toxicodendron), poison oak (Toxicodendron diversilobum, syn. Rhus diversiloba), and poison sumac (Toxicodendron vernix, syn. 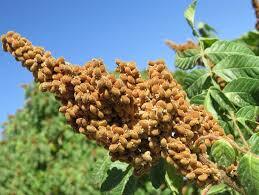 Rhus vernix), produce the allergen urushiol and can cause severe allergic reactions. Poison sumac may be identified by its white drupes, which are quite different from the red drupes of true Rhus species. Mowing of sumac is not a good control measure, since the wood is springy, resulting in jagged, sharp-pointed stumps when mown. The plant will quickly recover with new growth after mowing. Goats have long been considered an efficient and quick removal method, as they eat the bark, which helps prevent new shoots. Sumac propagates by rhizome. Small shoots will be found growing near a more mature sumac tree via a shallow running root quite some distance from the primary tree. Thus, root pruning is a means of control without eliminating the species altogether. ^ "Rhus L." Germplasm Resources Information Network. United States Department of Agriculture. 2009-11-23. Retrieved 2010-02-09. ^ "Rhus L." TROPICOS. Missouri Botanical Garden. Retrieved 2010-02-09. ^ Miller et al 2001. ^ Andrés-Hernández & Terrazas 2009. ^ Miller, A. 2004. Rhus sp. nov. A. 2006 IUCN Red List of Threatened Species. Downloaded on 23 August 2007. ^ Weekley, Ernest (1921). An etymological dictionary of modern English. Archived from the original on 12 October 2014. ^ Quattrocchi, Umberto (2000). CRC World Dictionary of Plant Names: Common Names, Scientific Names, Eponyms, Synonyms, and Etymology. IV R-Z. Taylor & Francis US. p. 2306. ISBN 978-0-8493-2678-3. ^ Christine Manfield, Charlie Trotter, Ashley Barber -Spice 2008 - Page 28 "Sumac This reddish ground spice is made from the berries of the sumac bush,"
^ Aliza Green Field Guide to Herbs & Spices: How to Identify, Select, and Use ... 2006 - Page 257 "In Lebanon, Syria, and Egypt, sumac is cooked with water to a thick sour paste, which is added to meat and vegetable dishes; this method was also common in Roman times. Sumac appears in the Jordanian spice mixture za'atar (page 288) ..."
^ Lee, Arthur (1888). Marble and marble workers: a handbook for architects, artists, masons and students. London: Crosby Lockwood & Son. p. 19. ^ Bass, George Fletcher; Allan, James W. (2003). Serçe Limanı: An Eleventh-century Shipwreck. Texas A&M University Press. p. 506. ISBN 978-0-89096-947-2. ^ Wu, T; McCallum, JL; Wang, S; Liu, R; Zhu, H; Tsao, R (2013). "Evaluation of antioxidant activities and chemical characterisation of staghorn sumac fruit (Rhus hirta L.)". Food Chem. 138 (2–3): 1333–40. doi:10.1016/j.foodchem.2012.10.086. PMID 23411251. ^ Ardalani, Hamidreza; Moghadam, Maryam Hassanpour; Rahimi, Roja; Soltani, Jalal; Mozayanimonfared, Azadeh; Moradi, Mehdi; Azizi, Ali (2016). "Sumac as a novel adjunctive treatment in hypertension: a randomized, double-blind, placebo-controlled clinical trial". RSC Advances. 6 (14): 11507–11512. doi:10.1039/C5RA22840A. ISSN 2046-2069. ^ Hoadley, R. Bruce (2000). "Chapter 5: Other Properties of Wood". Understanding Wood: a Craftsman's Guide to Wood Technology (2 ed.). Taunton Press. pp. 105–107. ISBN 978-1-56158-358-4. ^ Ortmann, John; Miles, Katherine L.; Stubbendieck, James H.; Schacht, Walter (1997). "Management of Smooth Sumac on Grasslands". University of Nebraska-Lincoln. Schmidt, Ernst; Lötter, Mervyn; McCleland, Warren (2002). Trees and Shrubs of Mpumalanga and Kruger National Park. Jacana Media. ISBN 978-1-919777-30-6. Andrés-Hernández, A. R.; Terrazas, Teresa (October 2009). "Leaf architecture of Rhus s.str. (Anacardiaceae)". Feddes Repertorium. 120 (5–6): 293–306. doi:10.1002/fedr.200911109. Miller, Allison J.; Young, David A.; Wen, Jun (2001). "Phylogeny and Biogeography of Rhus (Anacardiaceae) Based on ITS Sequence Data". International Journal of Plant Sciences. 162 (6): 1401–1407. doi:10.1086/322948. Pell, Susan Katherine (May 2004). Molecular systematics of the cashew family (Anacardiaceae) (PDF). Department of Biological Sciences, Louisiana State University. Archived from the original (PhD thesis) on 2008-08-21. Wikimedia Commons has media related to Rhus.